Doing Traffic Termination in Canada: Is It Possible? Many terminators are willing to make large sums of money in Canada via VoIP, but most of them are afraid to install equipment here. Canada is a high-tech country and people here know firsthand what VoIP termination is. At the same time, a high level of competition in the telecommunications sector and low VoIP rates do not contribute to a terminator’s earnings. On the other hand, Canada is a country of immigrants, which attracts large amounts of international traffic. If you install gateways in the country, you can make money, but it is going to be the hard way. To date, the country has a population of 36.4 million inhabitants. Only in 2015 the population of Canada increased by 370,156 people due to immigrants. Over the past year, immigrants from China (57,570 people), India (32,080), South Korea (8,215) accounted for the largest number of students. Immigrants settle in major cities of the country, close to the production facilities and educational institutions. However, many migrants, as well as native Canadians, move to other countries over time. Most of them go the US (about one million), France (600,000), Hong Kong (300,000), and Lebanon, Australia, China. If we trace the chain of requests and proposals for termination of calls regarding VoIP forum Canada, we will obtain the correlation with the above statistics. After all, these migrants have relatives and friends in other countries. So they will need cheap international calls at local rates. In addition, in Canada, there is a high level of access to the Internet. Only in 2014 there were more than 33 million users (94%). Mobile communication indicators do not lag either. In 2015, there were more than 29 million subscribers of mobile numbers (95%). Major mobile operators are Rogers, Telus, and Bell. Rogers has the largest number of subscribers. 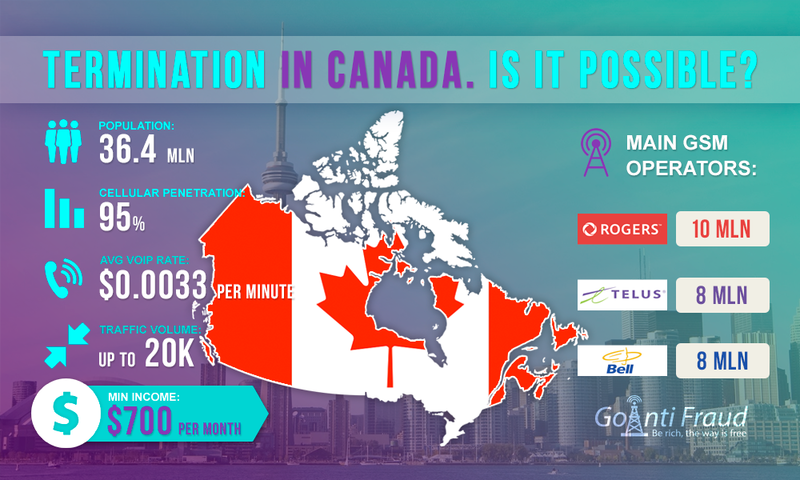 Its services are used by 10,143,000 people, while Telus and Bell 8.427 million and 8,381,000 users respectively. According to statistics, 90% of the subscribers connect to a major operator and several local companies, the remaining 10% buy the packages of smaller operators, for example, Shaw Communications (Freedom Mobile). However, not all provinces in Canada support the European GSM standard -850/900/1800 that creates some difficulties in using the mobile phone or VoIP-equipment. In addition, operators charge for everything they can. In fact, you purchase a "net" package, with payment for all calls, even if it comes to no-limit. Therefore, terminators need to take into account all of these factors when calculating the VoIP-minutes. One minute will cost as little as $0.00012. Requests for net traffic are 10-20K. VoIP cost per minute in Canada is $0.0033. When ordering a minimum of packages, net income per month is about $700. And when you install multichannel VoIP equipment, you can make more money.